Your doctor will consider both your symptoms and test results to diagnose eosinophilic esophagitis. This will include determining whether you have gastroesophageal reflux disease (GERD). Upper endoscopy. Your doctor will use a long narrow tube (endoscope) containing a light and tiny camera and insert it through your mouth down the esophagus. The doctor will inspect the lining of your esophagus for inflammation and swelling, horizontal rings, vertical furrows, narrowing (strictures), and white spots. Some people with eosinophilic esophagitis will have an esophagus that looks normal. Biopsy. 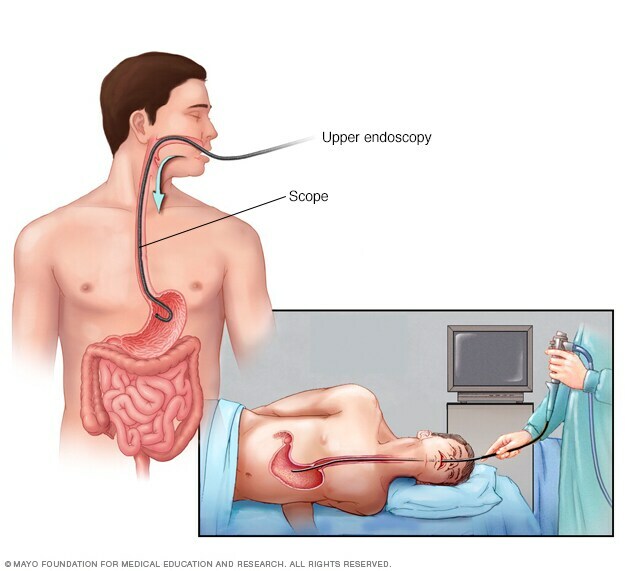 During an endoscopy, your doctor will perform a biopsy of your esophagus. A biopsy involves taking a small bit of tissue. Your doctor will likely take multiple samples from your esophagus and then examine the tissue under a microscope for eosinophils. Blood tests. If doctors suspect eosinophilic esophagitis, you may be given some additional tests to confirm the diagnosis and to begin to look for the sources of your allergic reaction (allergens). You may be given blood tests to look for higher than normal eosinophil counts or total immunoglobulin E levels, suggesting allergy. Depending on your response to tests for food allergies, your doctor may recommend that you stop eating certain foods, such as dairy or wheat products, to relieve your symptoms and reduce inflammation. A more limited diet is sometimes required. Proton pump inhibitor (PPI). Your doctor will likely first prescribe an acid blocker such as a PPI. This treatment is the easiest to use, but most people's symptoms don't improve. Topical steroid. If you do not respond to the PPI, your doctor will then likely prescribe a topical steroid, such as fluticasone or budesonide, which is a liquid that is swallowed to treat eosinophilic esophagitis. This type of steroid is not absorbed into the bloodstream, so you are unlikely to have the typical side effects often associated with steroids. If you experience severe narrowing (strictures) of your esophagus, your doctor may recommend dilation (stretching) to help make swallowing easier. Dilation may be used if steroids are not helpful. Or, dilation may be a choice to avoid ongoing use of medication. Elevate the head of your bed. If you regularly experience heartburn at night or while trying to sleep, put gravity to work for you. Place wood or cement blocks under the feet of your bed so that the head end is raised by 6 to 9 inches (152 to 228 millimeters). If it's not possible to elevate your bed, insert a wedge between your mattress and box spring to elevate your body from the waist up. If you're a parent of a young child, the doctor may also ask if your child has trouble feeding or has been diagnosed with failure to thrive.